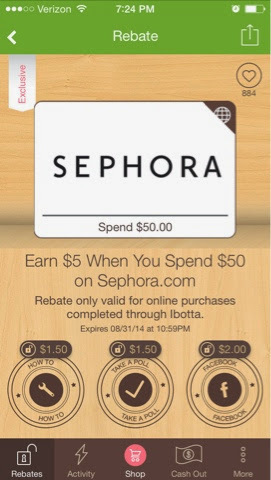 Right now and until 8/31 when you go through the free phone app ibotta this is my referral link to sign up - http://ibotta.com/r/f2ww and spend $50 or more at Sephora online you will earn $5 back !! Let me know what you purchase with this deal in the comments below. I really love how Ibotta is expanding their rebates. I wish I had a cell phone to take advantage of this offer. I've never purchased anything from Sephora before and this would make for a great opportunity! Thank you!